Migrant crisis: Is Germany far right rise echo of the past? The late German writer Guenter Grass once described his country's history as being like a toilet that would not flush. It was a provocative metaphor. The past simply would not allow itself to be cleansed from the present. Recently wandering through the eastern city of Dresden, as it tries to absorb thousands of migrants and refugees, I found myself constantly thinking: What would Grass have made of all this? Ever alert to his country's struggle with the past, Grass would surely have seen dangerous portents in the rise of the far right. Media captionIt said that hundreds of thousands of migrants must be found homes - or Europe's asylum system would collapse. Police have reported a surge in attacks against migrant reception centres. And in the Dresden suburb of Freital I met a local left-wing politician, whose office and car were bombed by neo-Nazis. "I'm scared," said Michael Richter. "I see parallels with 1933 and Hitler. Again we have a social movement that is getting out of control. I am more afraid of Germans than I am of the refugees." Mr Richter said there had been a failure on the part of moderate politicians to unite against the far right. He is worried about how anti-refugee and anti-migrant rhetoric has been entering the mainstream political discourse. This is a recurring theme on the left these days. Nearby, on one of the vast anonymous housing estates of the communist-era, Dirk Timmelmans was waiting for a taxi to take him into town. Born and brought up in Freital at a time when the steel factories guaranteed work and state socialism preserved a smothering certainty, he feels his world is changing at a bewildering pace. "Am I afraid of the refugees?" he asked. "It's just too much for Europe. There are too many of them coming here. We can't take it. "Our government doesn't understand what's going on here. What has happened in Paris will happen here." I heard in Dresden what I have heard in so many places where xenophobia or racism takes root - a prevailing conviction that politicians live in a protected, parallel universe. About a 10-minute drive away at the Hotel Leonardo - a grimly functional guest house converted into a centre for refugees - I met Saman Sherko, a Kurd who was badly wounded fighting militants from Islamic State (IS) in northern Iraq. He came to Freital four months ago and described an atmosphere of hostility. "They use bad language. They have beaten us with batons. They come on motorcycles and speak abusively to us," he told me. "It has increased after the Paris attacks." With a history so crowded by ghosts, Dresden is an easy city in which to believe that the past might repeat itself. But it is an erroneous notion, even if it is brought to mind by thousands of chanting voices at night-time rallies, or by angry shaven-headed men screaming abuse at refugees. No, there is no new Reich waiting to be born in Germany's east. Certainly strident voices are stirring and support for the far right has increased. But a sense of proportion is needed. Angela Merkel's Germany is not the beleaguered and economically battered Weimar Republic from which the Third Reich emerged. There is a vibrant democracy with a free press and strong public institutions. The police and justice system protect the vulnerable. Pegida founder Lutz Bachmann, who lives in Freital, is being investigated on charges of using hate speech after he described migrants as "animals" and "scum" on his Facebook page. There have been significant public demonstrations against the far right. There is also a highly organised network of civil society activists who provide practical help and advice to newcomers. 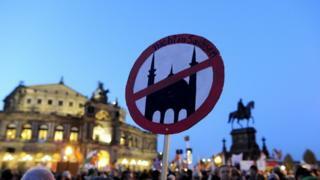 At the Islamic Cultural Centre close in Dresden the word "Murderer" was sprayed in stark black paint by a German man. But he was spotted and reported to police by a German woman who lived nearby. The Marwa El-Sherbini centre was named after an Egyptian woman murdered in a xenophobic attack in 2009. That knowledge made my encounter there all the more striking. In a backroom four Germans were learning Arabic from an Egyptian architect who has lived in the city for the past seven years. Dr Magdi Khalil said there had been reports from Muslims of being abused in public after the Paris attacks but "I meet many more people here who behave with kindness". One of his German pupils, Lucas Paeth, said that he knew men in their 20s like himself who had been drawn to the far right. "I struggle to understand it. They grew up in the same way and went to the same school as I did." For Lucas it was important that Dresden was not stereotyped as a bastion of the far right. "That is part of the story of our city and we have to face it. But it is not the only story." Will Germans embrace or shun refugees?